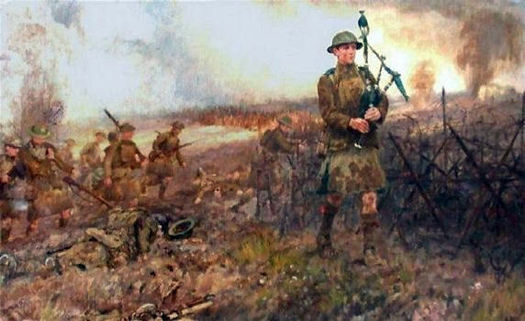 In the First World War, pipers were used as a psychological weapons to inspire the troops and instill fear in the enemy. They volunteered for the honour of leading the charge from the trenches. The casualty rate among pipers was truly horrific. Piper James Richardson of the 16th Battalion, depicted in the painting above, won the Victoria Cross for his bravery in playing the bagpipes above the trenches in the Battle of the Somme, while exposed to intense enemy fire for an estimated 20 minutes. Piper Richardson is the only Canadian piper to have won the Victoria Cross, the highest of all British and Canadian military decorations. The painting depicting Richardson's gallantry was by James Prinsep Beadle. The original hangs in the Officers' Mess of the Royal Scots Regiment in Edinburgh. discuss the formation of a Highland Regiment in Victoria. in existence, and was temporarily administered by a civilian committee. Victoria offered their full support. Scottish Regiment for guards of honour. parades being the sendoff for the 30th Battalion, C.E.F. which took place on Feb.
15, 1915 in which all the military bands then in Victoria took part. G. Birnie, W. Calder, J. Parks, C. Wilson, A. Dunsmuir, A. McDonald, W.
MacGregor, C. Coutts, C. Sims and A. Wallace. The Drum Major was N.
been identified, T. Whishart and W. Muir. the 72nd Seaforth Highlanders of Canada from Vancouver, B.C. formed in 1911.
entered the newly formed 16th Btn. C.E.F. Major, Sandy and John Chisholm, Alex Ferguson and John Low Sr.
and drum band of the 88th, on even days). bugle band members have been identified as: Sgt. Bugler Meads, Buglers W.J. H.D Wallis, McLaren, O.M. Ferrabee, W. Pauline, G. Murray, J. Rodger, J.
Langton, V. McKinnon, C. Lang, J.D Rochford, V. Hodding, Pomeroy, H.D. buglers served over-seas with various units: F.C. Alexander, A.A. Bates, H.D. Bowerman, E.J. Diespecker, J.S. Plows, C. Abbot, F.V. Richardson and L. Marrs. vicinity of the Grand Stand"!